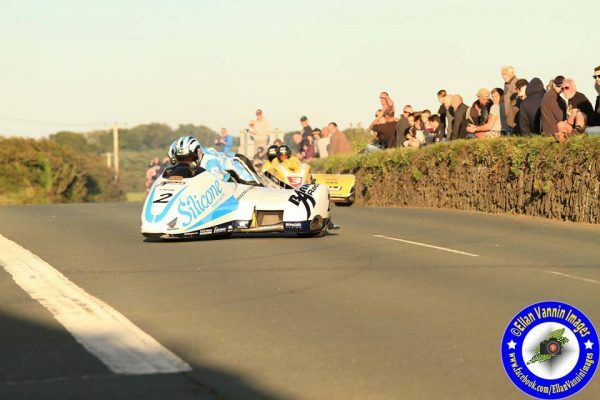 Three wheel action of the very highest quality is firmly on the horizon for next weeks Southern 100, as many of the world’s best Sidecar teams battle it out for victories on the famous Colas Billown course. Amongst those hoping to taste the winners champagne include reigning Sidecar championship victors John Holden/Lee Cain. Since joining forces last year, the crew have gone onto record four successive second place finishes at the TT Races, plus have also as illustrated by their premier race crown of 12 months ago been firmly in the mix for race honours at Billown. Unquestionably capable of going unbeaten at this years Southern 100, like the Silicone Engineering Racing duo you can apply the same notion to Carl Cox Motorsport’s Tim Reeves/Mark Wilkes. Reeves/Wilkes third in both Sidecar races of TT 2018, are quietly confident of chalking up next week multiple race wins. Others extremely capable of mounting rostrum finishing challenges include former TT winners Conrad Harrison/Andy Winkle and Oliver’s Mount maestros the Ramsden’s Steve & Matty. Further depth to the entry is provided by Greg Lambert/Julie Canipa, plus a host of high profile event debutants, which include Alan Founds/Jake Lowther, Pete Founds/Jevan Walmsley and Silicone Engineering backed Lewis Blackstock/Patrick Rosney. Plus the all French female team of Estelle Leblond/Melanie Farnier and next generation crew Lee Crawford/Scott Hardie, who have enjoyed sustained success in recent years at Oliver’s Mount. Not a newcomer to the course, but a newcomer to Sidecar racing on the roads, it’s going to be interesting to see how competitive Maria Costello MBE will be with her NGK backed outfit. Joined by Sarah Stokoe for her maiden Sidecar roads voyage, the former Senior Classic TT rostrum finisher is looking forward to the new challenge. “We’ve had some good short circuit outings, shaving a whole 4 seconds off our previous sidecar personal best at Donington Park. Sarah has a great approach and has been putting in the homework to learn the course. We’ve both been watching on board footage. A perennial favourite with fans of the Southern 100, Sidecar competition at Billown in recent years has gone from strength to strength. Whilst TT lap record holders the Birchall’s Ben & Tom may not be competing, it takes nothing away from what is one of the most high quality entries of modern times, illustrating the popularity of three wheeling competition on the Colas Billown course.